How many foreign and domestic tourists visit your city? How many visitors go to a cultural festival or sports event? Where do they come from? How many days do they spend in the country or municipality? Tourism statistics created with Mobile Big Data offer new possibilities for measuring the demand side of inbound, domestic and outbound tourism. Mobile Big Data provides the best opportunity for measuring the mobility of tourists. Anonymised data from mobile phones allows the generation of statistics for inbound, domestic, and outbound tourism flows, describing the places that tourists visit, the duration of their stay, and the distribution between overnight stays and same-day visits. The statistics can be generated on a national scale and used for national tourism statistics, balance of payment travel items, as well as geographical breakdown by sub-regions, municipalities, and smaller locations, such as tourism attractions. Mobile Big Data can provide great insights on event visitation and assessing the tourism effect of an event to regional economy. This provides statistical arguments for public or private sponsorship and the financial support of the event. 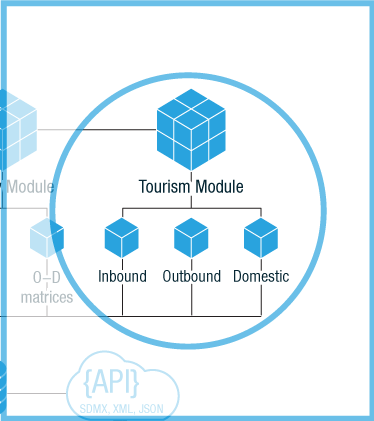 The main users of tourism statistics from Mobile Big Data are national and regional tourism boards, national statistics offices, central banks, municipalities, and event organisers.